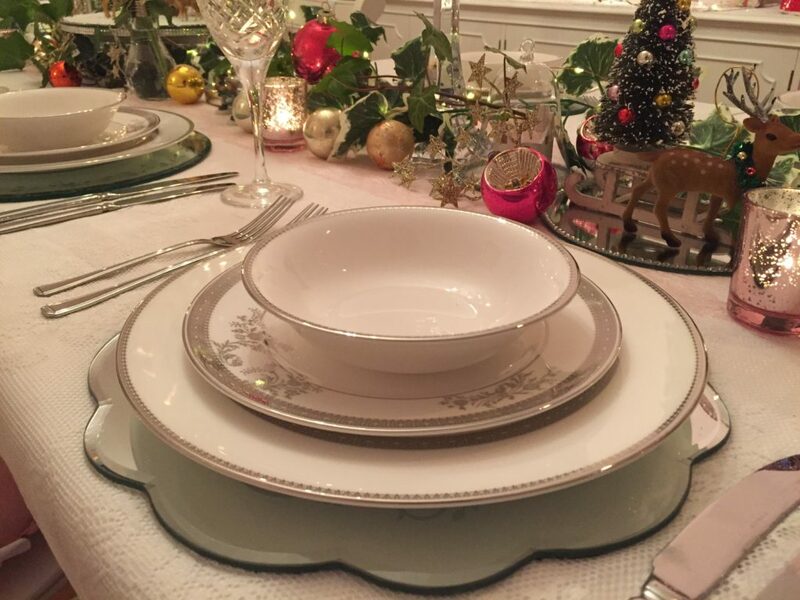 Setting a pretty table has always been a big passion of mine and I’m a great believer in making every occasion special and taking the time to include little details which will appeal to all my guests. 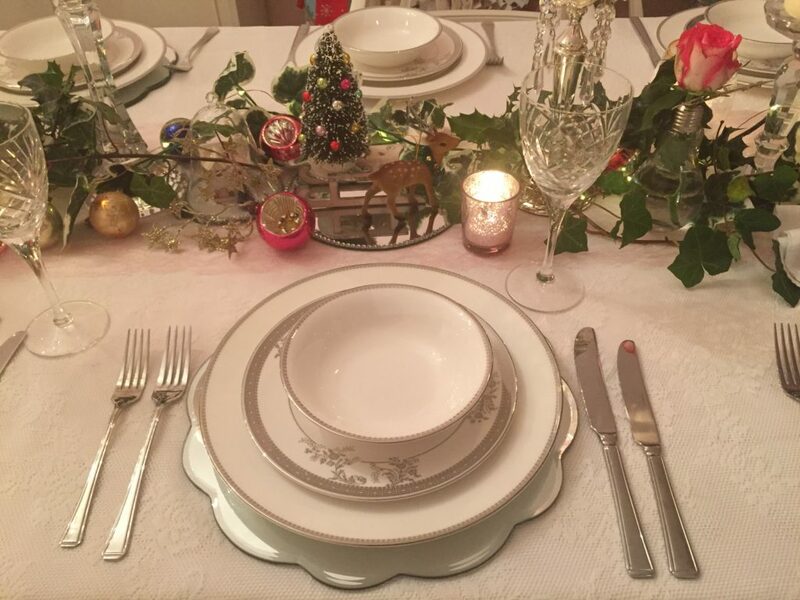 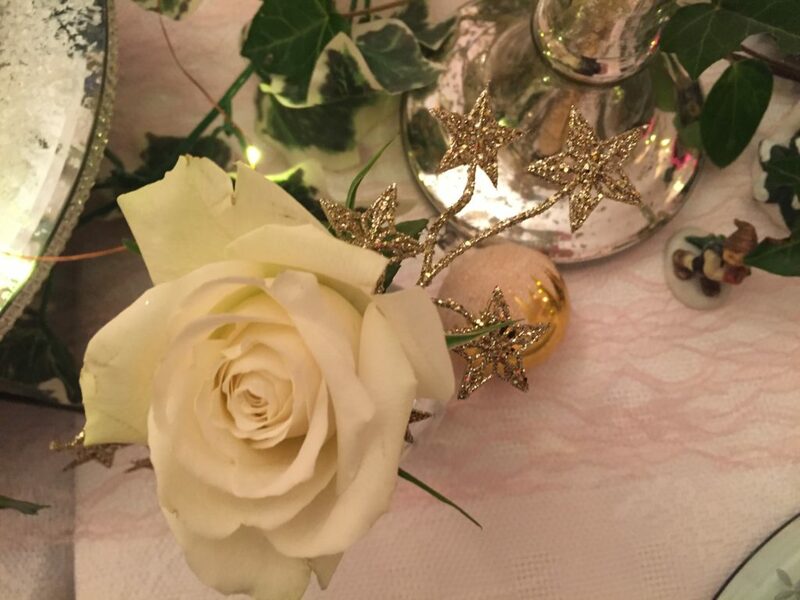 Last Christmas I used vintage china and beautiful floral vintage glasses with lots of pastels on the table but this year I have borrowed my daughter Rebecca’s gorgeous wedding china which is Wedgwood Vera Wang Lace and used my crystal stemmed glasses. 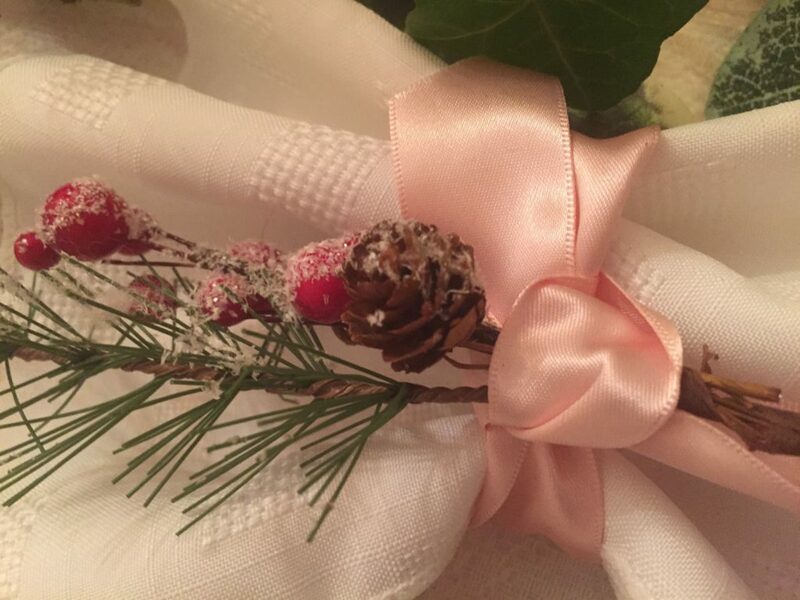 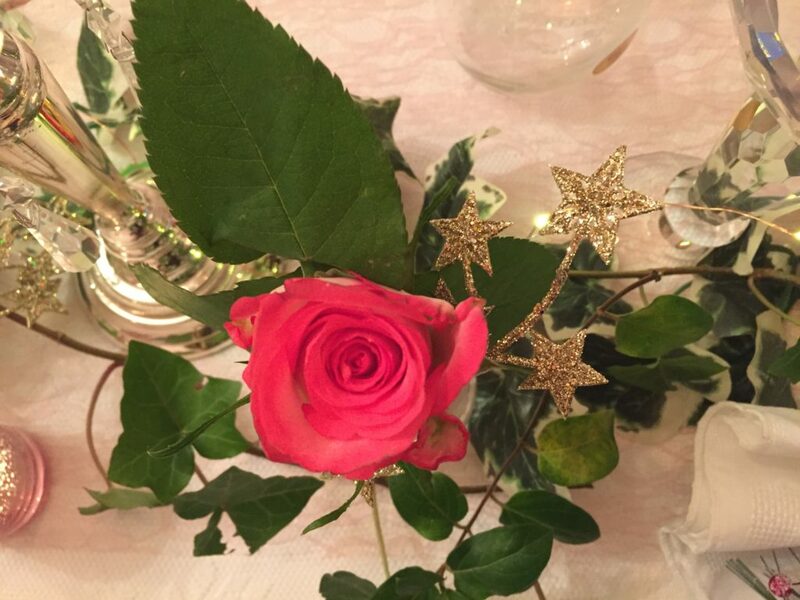 I tied pink ribbon round white napkins instead of using napkin rings and added little festive sprigs to them. 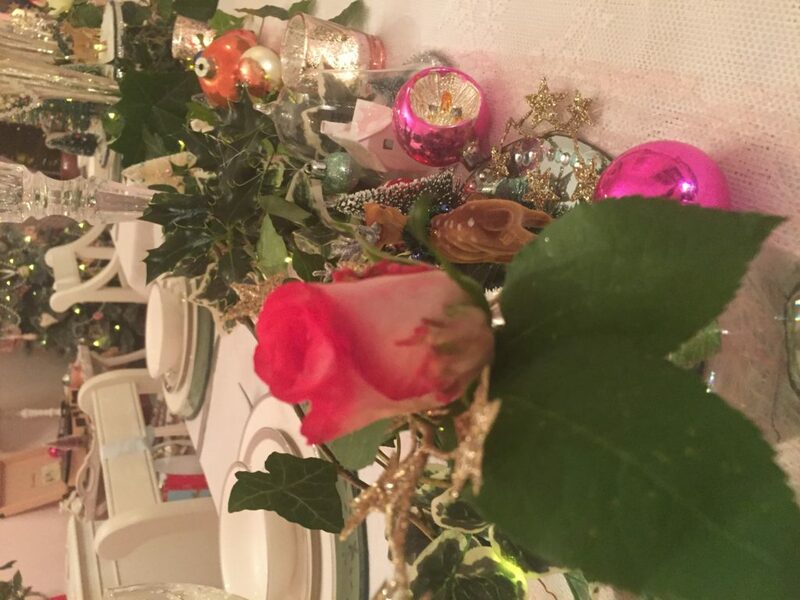 If you remember my Christmas table from last year I had a woodland theme with little deer etc and I decided to do that again but this year I’ve added in a lot of greenery and vintage baubles dotted amongst it for some colour as well as some beautiful fresh roses. 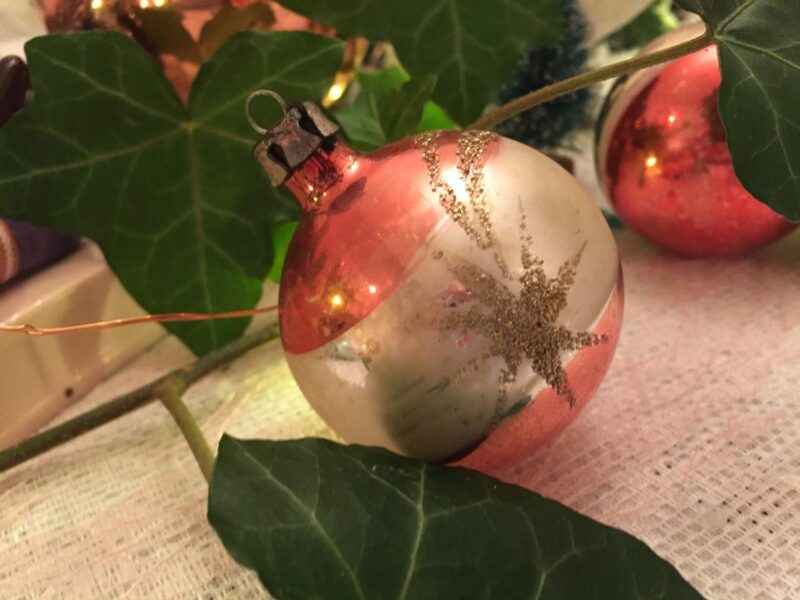 A tip I picked up from a florist friend is to start off your greenery with some fake ivy as this gives you a base to start from and it makes it a lot easier to add in the fresh foliage later on. 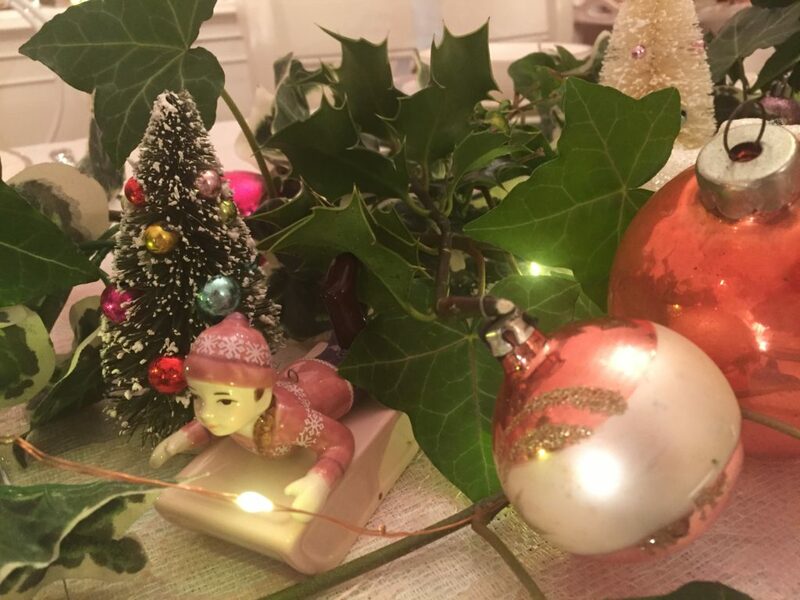 I then added freshly picked ivy and holly with some roses and then placed the baubles amongst it along with little glass tealight holders and put a string of copper wire fairylights through it all to add lots of twinkles. 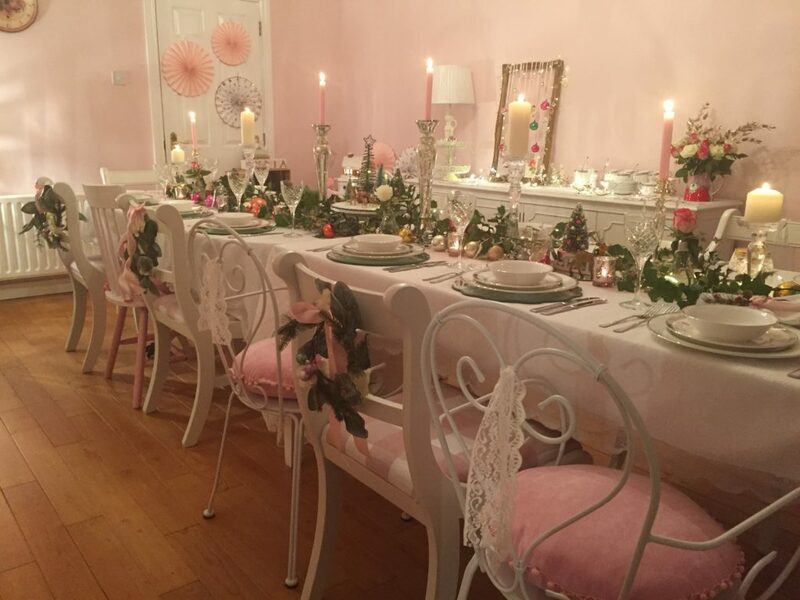 I used candle sticks of varying heights along the middle of it all with a mixture of pillar & dinner candles in pink & cream. 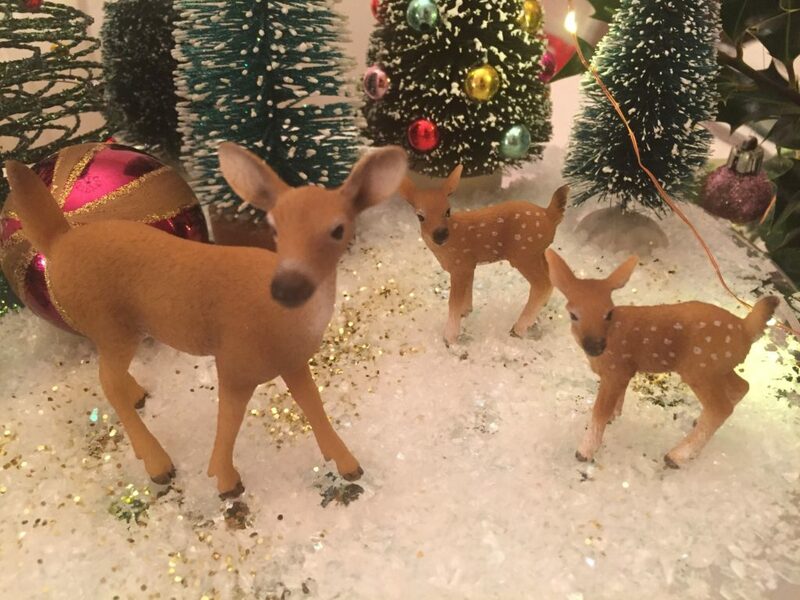 And I may have added in a few sprinkles of glitter along the way!! 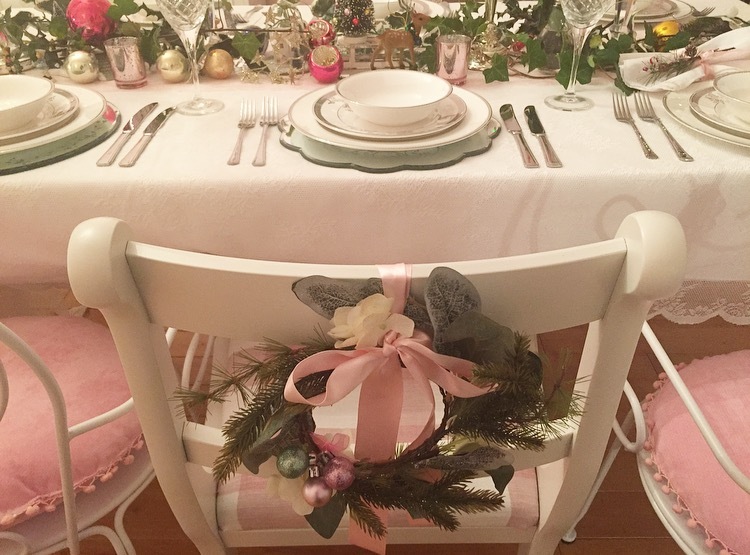 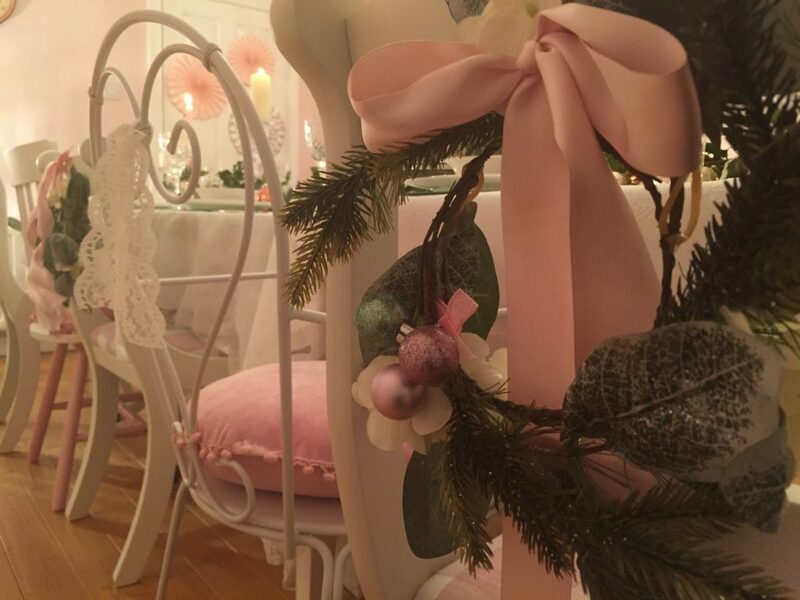 I tied mini wreaths with pink ribbon and some lace alternately on each chair back to finish off the look. 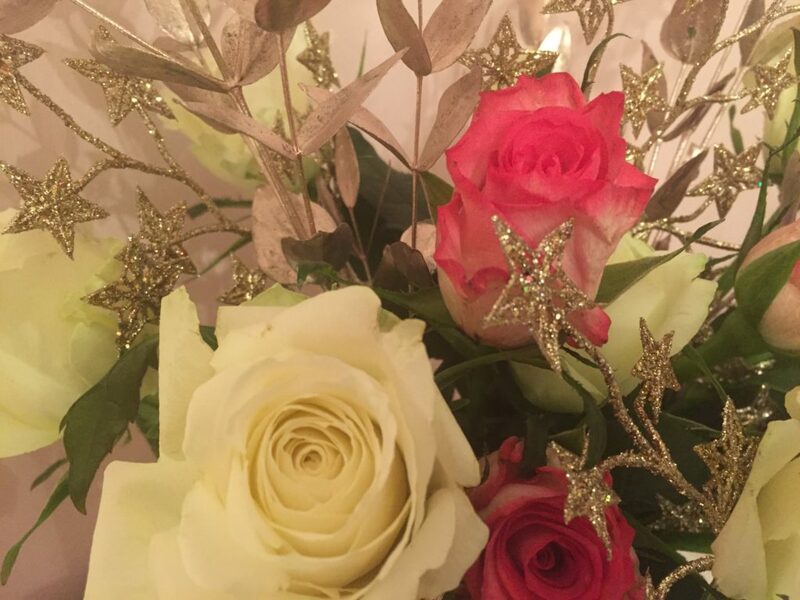 The mini wreaths were less than a pound each in The Range sale which was an absolute bargain and they’re very pretty used as candle rings as well. 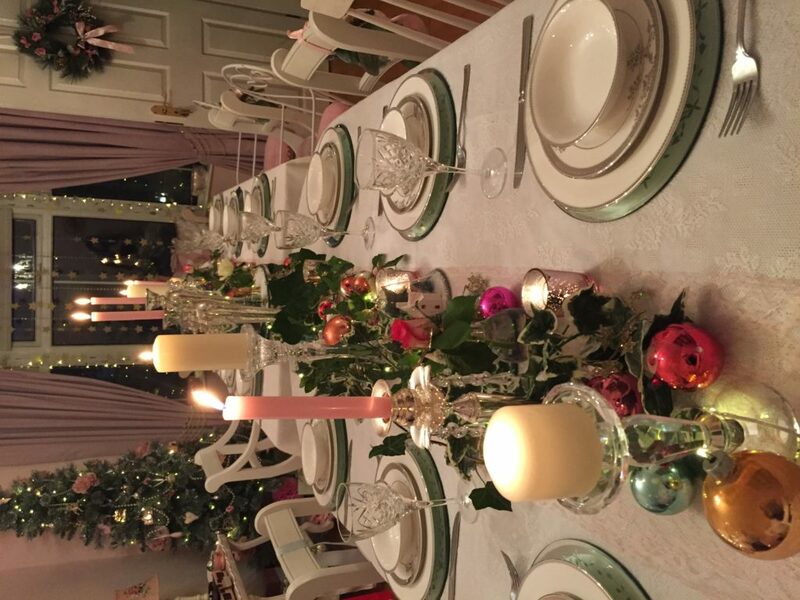 So that’s my Christmas table done for another year. 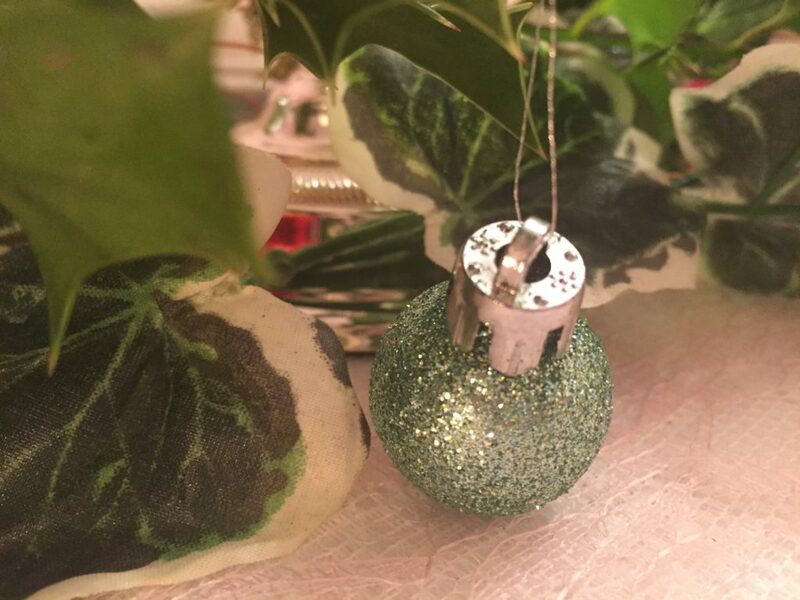 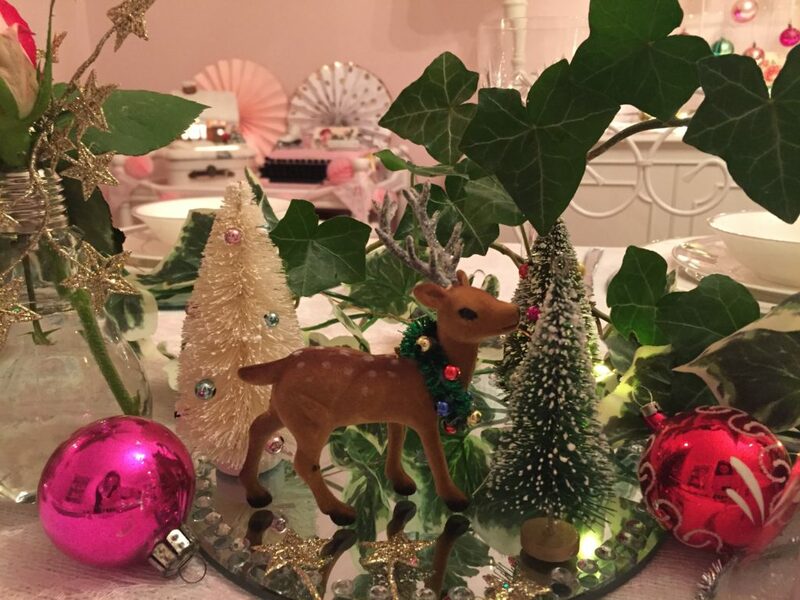 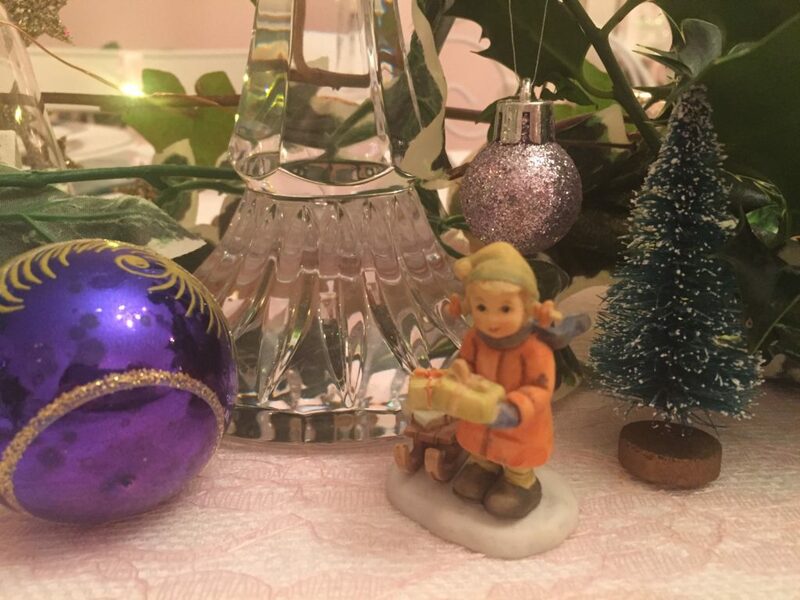 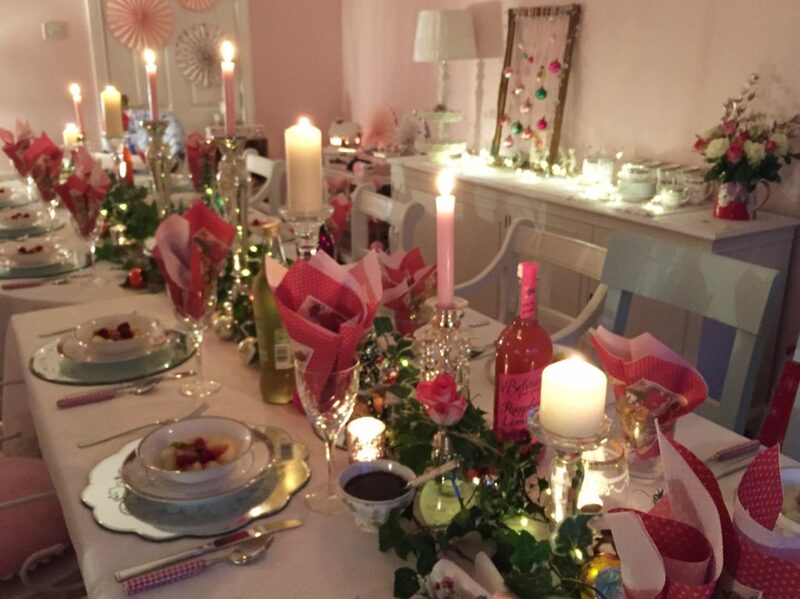 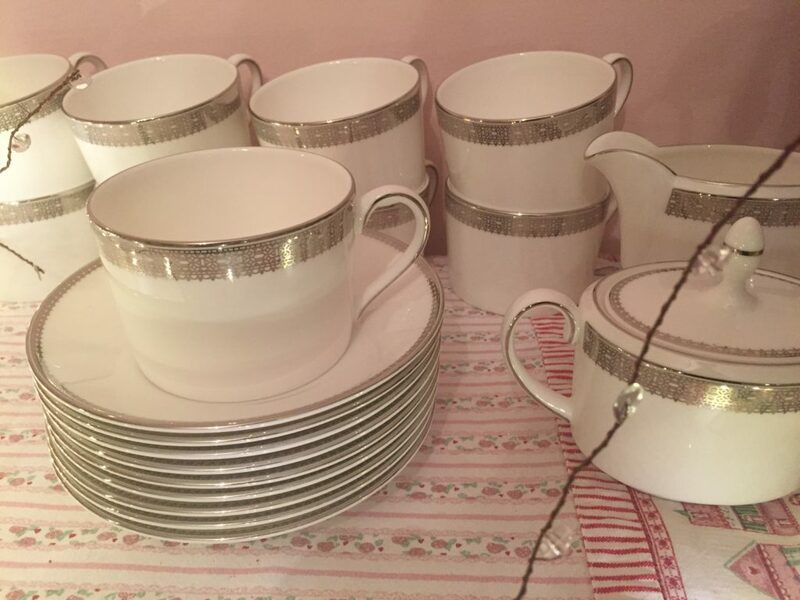 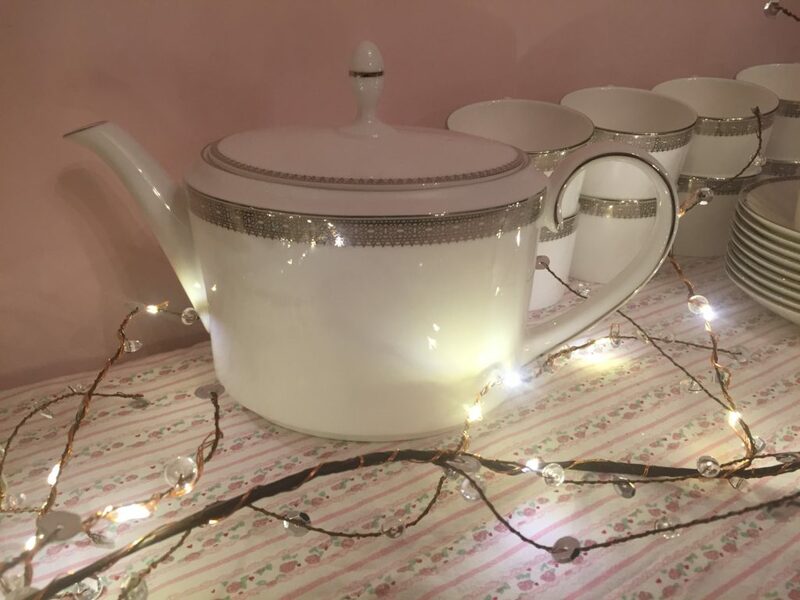 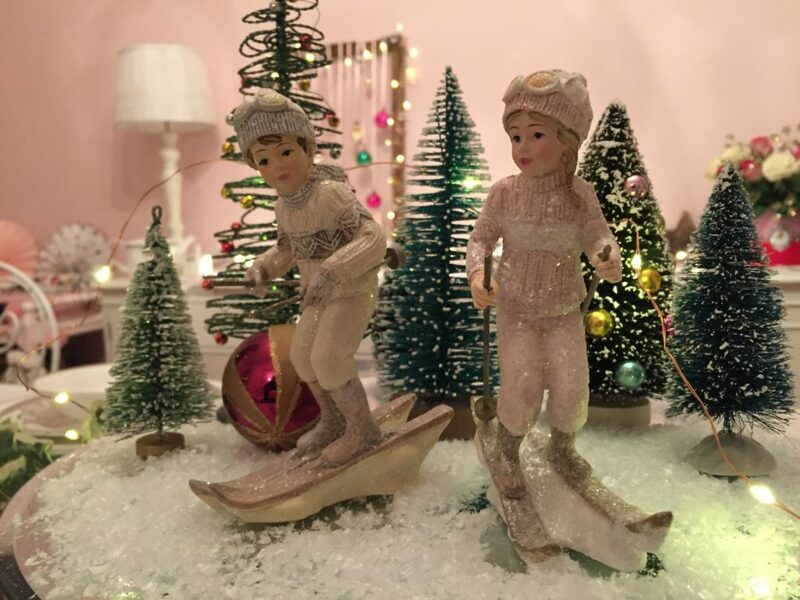 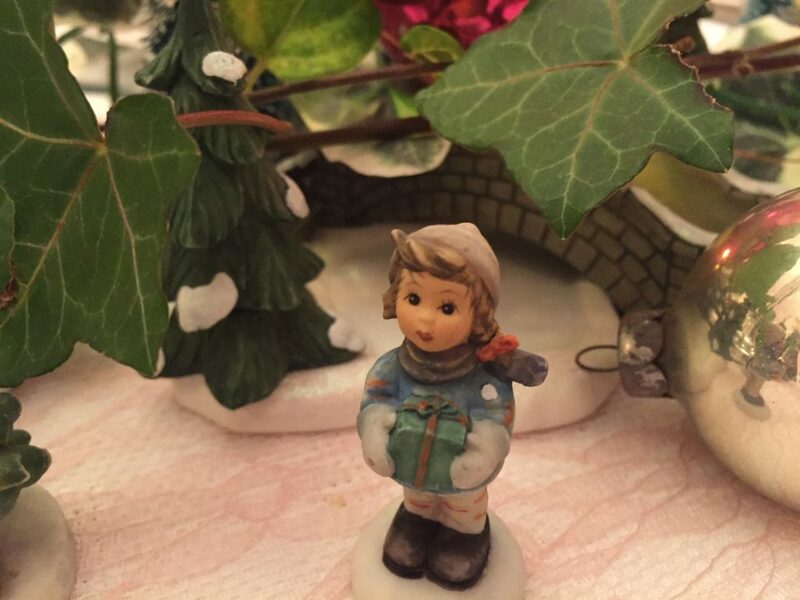 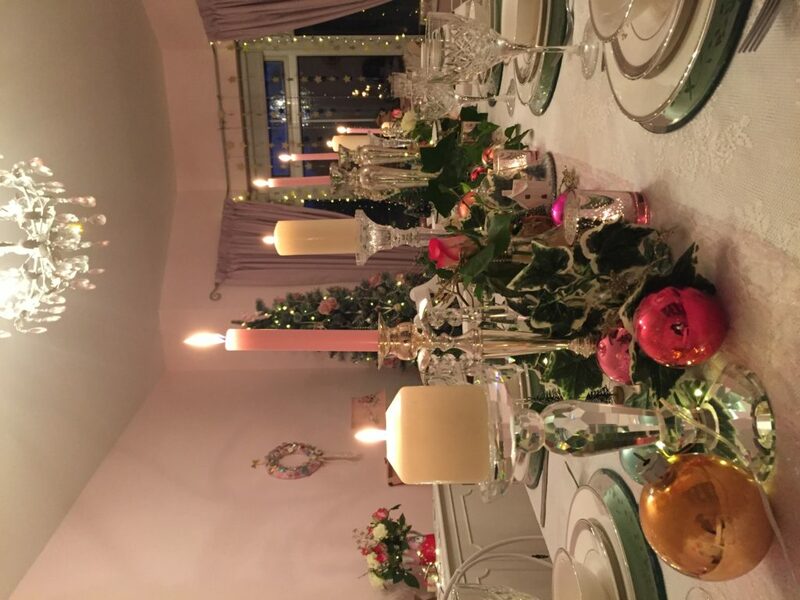 I’m loving scrolling through IG & FB to see how everyone else has decorated their tables and this is the first year I’ve actually blogged about mine as I usually just put the pics onto my Vintage Room FB. 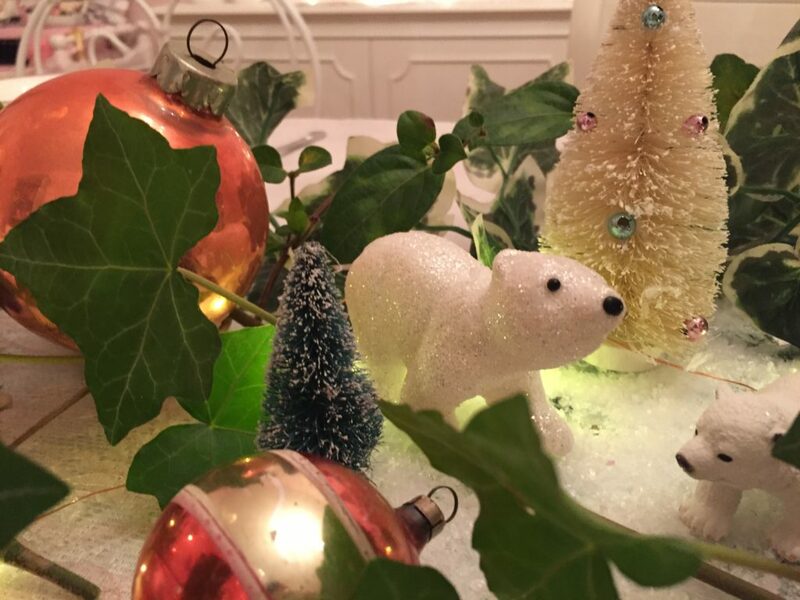 I’ve established lots of online friendships over the last 6 years or so through my FB page and it’s so lovely to interact with people from all over the world and many of them send me pics of their Christmas decor which I love! 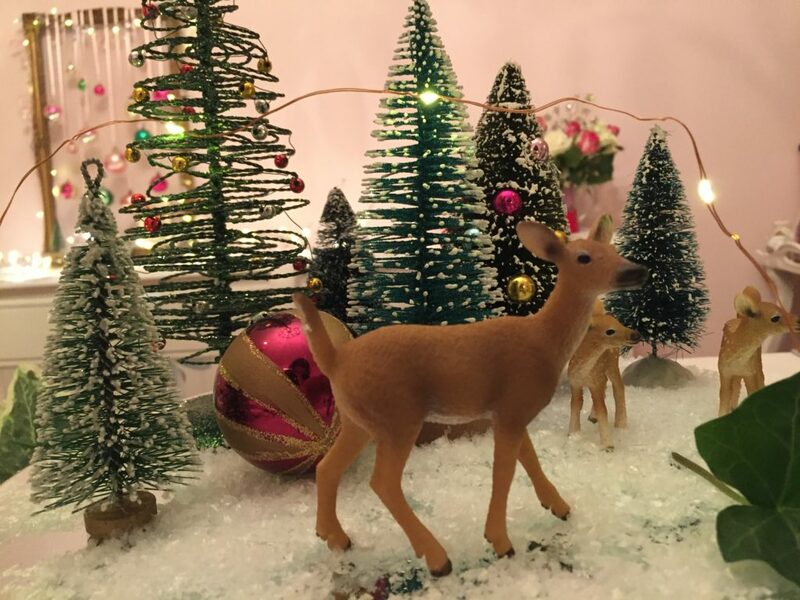 I’ve had so many lovely messages from people thanking me for sharing my ideas and Christmas decor which is so lovely and I really appreciate them taking the time to do so!